One of my favorite day/weekend trips from LA is the Sequoia National Forest. I went most recently with two of my friends to celebrate Easter (more accurately to avoid the Easter brunch/church/children scene). It takes an hour driving down Avenue 56 to get from Ducor to the Sequoia Forest (the Trail of 100 Giants). The landscape drastically and quickly changes from farmland to rolling hills to the forest. There was snow on the ground and signs stating that the trail and parking area were closed for the winter (and upon actually reading the website I see that they were closed and do not open until May). But it was April 1st and we hadn't seen another car in over an hour; so we decided it was a joke and to illegally park and go anyway. It's hard to capture how big the Sequoias really are. Some of them are over 1,500 years old. We spent 45 minutes running around and climbing things and trying out various outfits and lighting. Looking through these photos I look fully psycho in non workout clothes in the woods, at a certain point I had on a bathing suit and a fur coat with satin shoes. I would like to note that, despite my appearance and commitment to 5 inch heels, I had to live in the woods for 60 days when I was a teenager (as part of an outward bound program my parents sent me to). I can start a fire with three sticks and a rock. I spent four days alone in the woods with no food or water as part of a 'vision quest'. Said outward bound program is no longer in existence, but I survived it. I still have a strong aversion to camping. There is a beautiful lookout point a couple miles further down the road past the Trail of 100 Giants (see above image from last fall), but there was snow and we didn't really want to hike through it, so we decided to head south to Kernville. There was a sign saying that the road was closed, but we figured that was also a joke and drove around the barricade. Unfortunately about 5 minutes later we got stuck in the snow. We were very upset and running around in heels and furs trying to dig the tires out of the snow and push the car -it didn't work. A few minutes later another car, the first one we had seen in hours, drove by us on the closed road. They stopped, and miraculously had some sort of a tow line that they hooked to our car and dragged us out of the snow. We drove all the way down Highway 99 following them, but at the bottom it was barricaded with a steel gate that was locked and so we had to go back. We got stuck in the snow again and they had to drag us out -- again. I did not photograph these moments. They did give us an extremely useful piece of advice - put your floormats under your tires if you get stuck in the snow - they will give your tires enough traction to pull forward. The above image was also taken last fall at the Kern River, which runs along the road that was closed (Mountain Highway 99). This is my preferred way to go from the giant sequoias the Oynx General Store (best food in a hundred mile radius). However, because the road was closed we had to go an extremely long and roundabout way that isn't really worth explaining. We sat in the garden of the General Store and ate sandwiches and were very happy to not be stuck in the snow on a closed road with no cellphone reception. Afterwards we drove through the Mojave desert back towards Los Angeles and stopped at Red Rock Canyon. 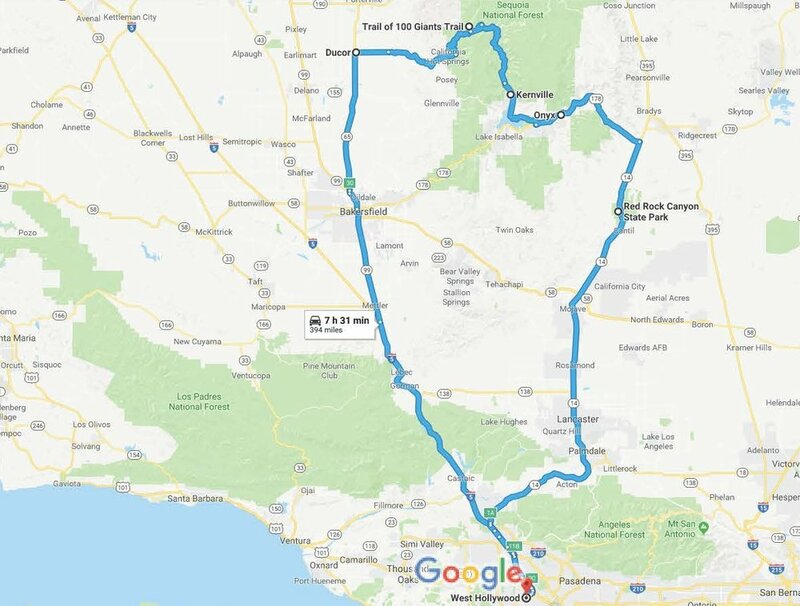 I made a map of the loop from Los Angeles to the Sequoias, down the river, to lunch in Oynx, to Red Rock Canyon, and back to LA. It's a seven and a half hour drive. We left LA at 4:30am and got back at 8pm. I imagine some (most) people don't want to do things in such a rapid fire way. An alternate, more chill way of doing this is to go to the sequoias, hang out spend the day exploring them. Then drive down highway 99 into Kernville and rent a house there (you do not want to stay at any of the hotels there - trust me), try this cabin. Have dinner at Ewings. Go to one of the two weird bars in the town - rage. Get up in the morning and go white water rafting. Then drive to the Oynx General Store for lunch and through the Red Rock State Park back to Los Angeles.